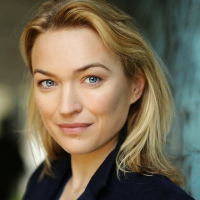 Looking every inch the up-and-coming British actress in fashionably striped navy blazer, pink t-shirt and blue jeans Sophia Myles is looking surprisingly relaxed considering the chaos surrounding her. On a gruelling press junket to promote her forthcoming film, romantic epic Tristan + Isolde, twenty-six year old Sophia is merrily chatting away despite the stream of journalist lined up to talk to her. The daughter of a Vicar, Myles was spotted by writer Julian Fellowes (Gosford Park) at the tender age of 16 in a school play, and having turned down a place at Cambridge to study Philosophy her career has quickly accelerated. Numerous TV parts led to her landing the exceedingly plumy role of playing Johnny Depp’s wife in the Dickensian thriller From Hell, as well as breathing life into iconic British puppet Lady Penelope in the real-life adaptation of Thunderbirds. Up next for in director Terry Zwigoff’s festival favourite Art School Confidential alongside John Malkovich, Jim Broadbent and Anjelica Huston, and currently filming Hallem Foe, alongside Jamie Bell in Scotland, there seems to be no stopping Sophia. With her refreshingly open demeanour and good old fashion British work ethic, whether she likes it not, Sophia may soon be as an ubiquitous as Miss Knightley.